The Wildlife Sites section on the website has been rewritten. The old menus have been replaced with buttons which will take you to the page describing each location in detail. 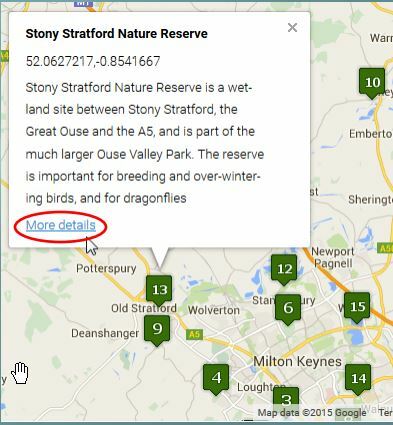 There is another new feature, an interactive map to help you explore local reserves. Click on any of the map pins to show a brief summary of the reserve. Click on the More details link to go to the site description. And that’s not all. Ian Saunders has written descriptions for Linford Wood and Stony Stratford Nature reserve and he will be producing descriptions on other wildlife sites in the area. We hope you enjoy the new features, so get clicking and then go and explore your local wildlife sites.